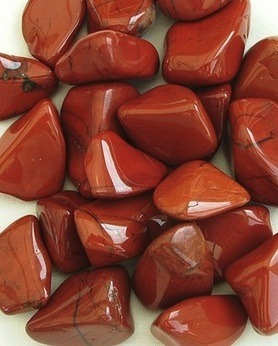 RED JASPER grounds energy, and makes an excellent worry bead, calming the emotions when played with. It is a stone of health, which strengthens and detoxifies the circulatory and blood system (particularly the liver), and supports the digestive system and base chakras. BROWN JASPER is connected to the Earth and base chakras, and brings stability and balance. It is an excellent aid for deep meditation and exploration of past lives. YELLOW JASPER protects you during actual physical travelling and spiritual travelling, whilst channeling positive energy. It overcomes exhaustion, aids the immune system, Associated with Solar Plexus chakra. PICTURE JASPER like Brown Jasper, is associated with the base chakra and is connected to the Earth’s consciousness and ecological issues. It will bring to the surface any hidden or repressed feelings and thoughts, and enable you to understand and learn from them. Picture Jasper stimulates the immune system and cleanses the kidneys.